Comes with a coarse roller head with diamond crystals that gently but effectively buffs away hard skin, leaving feet feeling soft and silky smooth. Ergonomically designed handle is moulded to fit the hand, making it extremely comfortable and pleasant to use. And its roller head is uniquely designed to cover your feet's curves and spin 360 degrees for quick results. 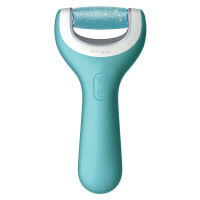 Amopé Pedi Perfect Foot File has a unique roller head with diamond crystals, which effortlessly buffs away thick, hard skin revealing silky smooth & touchably soft feet after your first use. Apply moisturiser and massage into your fabulous smooth feet! © 2019 Reckitt Benckiser. All rights reserved. Your product order must total $50 or more after all coupons and discounts are applied.